TAG Heuer Connected Modular 45 watch with dial created by graffiti artist Alec Monopoly, was unveiled at Art Basel Miami. I have always loved art. I grew up in a family where my mother was an artist and my sister was an artist. My mom had an art gallery at one point in her life and my sister was a talented VP at a top NY ad agency. Even my oldest sister — an astrophysicist by education — has unveiled her incredible artistic side and is, today, a painter in Tucson. So, every year, when Art Basel Miami rolls around … I know it is the place for me to be. (Of course, truth be told, I also love the sun and the beach.) This year, when the invitation came in from TAG Heuer to join the brand for the unveiling of a new dial and the in-person painting of 300 straps created for its Connected Watch by graffiti artist and painter Alex Monopoly, I jumped at it. I wasn’t disappointed. Alec Monopoly — a TAG Heuer brand ambassador for its “Don’t Crack Under Pressure” campaign — not only spray painted 300 rubber watch straps in front of us, but also showed off his new dial design for the Connected Modular 45 watch, repelled 40 feet down the side of the Fontainebleau Hotel — painting on a multi-story mural of his while doing so– and unveiled a TAG Heuer Monopoly sculpture. 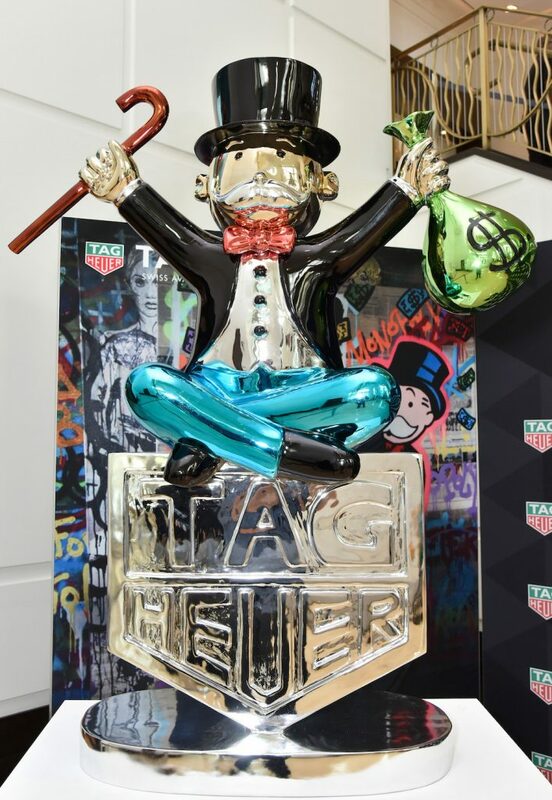 Alec Monopoly is a brand ambassador (Artist provocateur) for TAG Heuer. 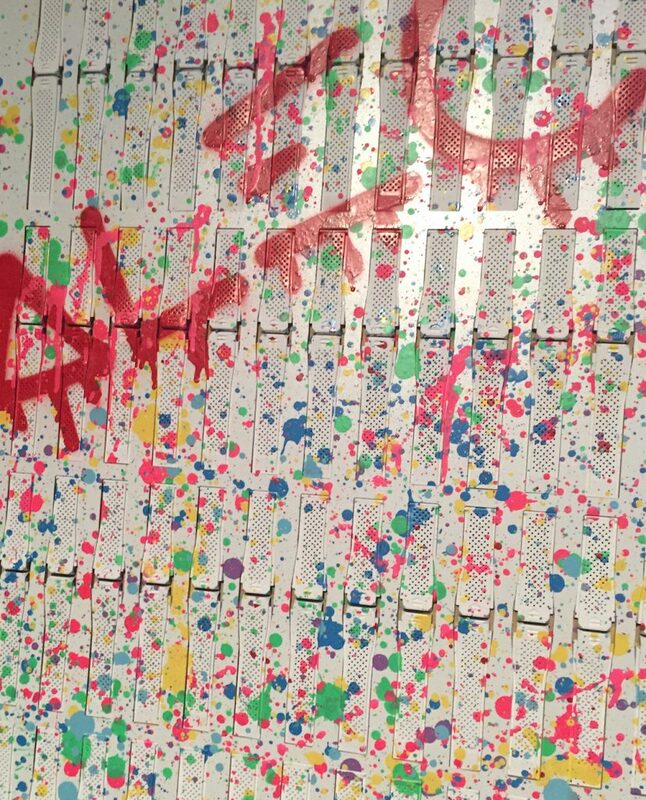 For those unfamiliar with Alec Monopoly, nee Alec Andon, we bring you a crash course. The 31-year-old artist specializes in street art, and has spray pained many an abandoned warehouse or billboard. It was in 2008 — during a recession — that he conceived of the idea of taking on the persona of Uncle Pennybags, the banker from the famed Monopoly board game. Not only does he always wear long chains around his neck and a top hat, but also most of his signature paintings include “Mr. Monopoly” or the penny bags … his own private statement on capitalism and earning a living. Another of his signature looks is the large bandanna or surgical face mask he wears to protect his identity. While he has been arrested several times for illegal spray painting, he tries to keep his identity private. 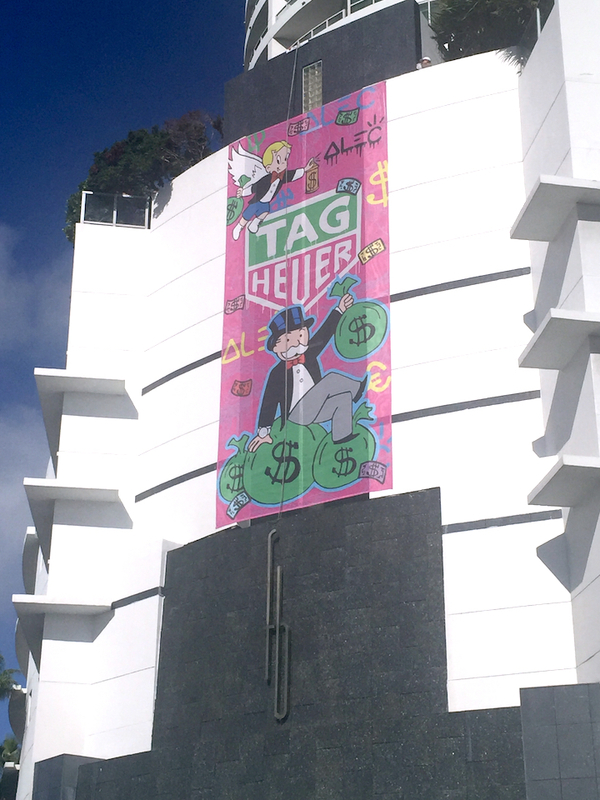 Alec Monopoly completed the painting of the 300 straps during the Art Basel Miami TAG Heuer event. Straps placed in the upper left corner of the board will have a bold red line that is part of his signature. During the event in Miami with TAG Heuer, Alec Monopoly brought a huge board — on which he had assembled 300 white rubber straps and painted the preliminary colors before hand — and put his final finishing spray-paint touches on the straps that would comprise a limited edition TAG Heuer Connected Watch Modular 45 offering. For that watch launch, there is also a specialized dial with Monopoly’s signature graffiti design on it, and there is special packaging for the TAG Heuer Connected Watch Modular 45. While the watches can be pre-ordered on line at TAG-Heuer, if you get the chance to pick the strap you want, go for one that seems to have a bold red/orange line through it. The reason I say that is because while all of the straps are unique, the straps that were placed at the top left of the board have a portion of his signature spray painted in red on them. Alec Monopoly scaled the side wall of Fontainebleau Hotel, paining on the multi-story mural along the way. “I am thrilled to return to Art Basel Miami and celebrate the one year anniversary of my announcement as Art Provocateur for TAG Heuer”, says Alec Monopoly. 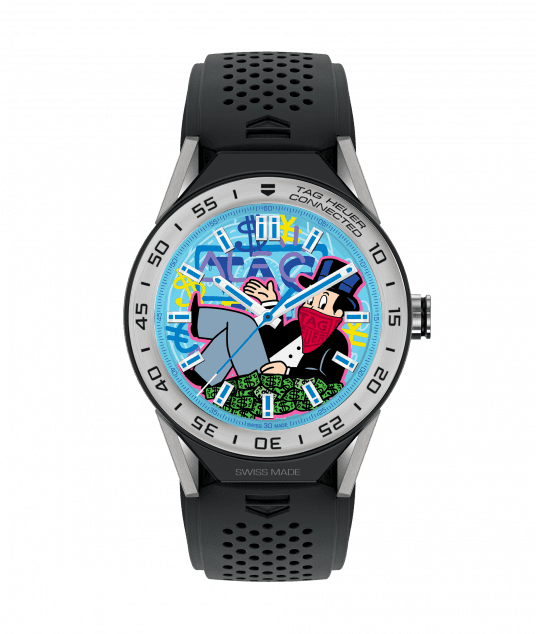 “It’s exciting to celebrate the occasion with new artwork that depicts both my love of timepieces and the vibrant energy of South Beach.” Earlier in the year, TAG Heuer unveiled the Alec Monopoly Formula 1 watch. This newer design is one of the optional faces for the Connected Modular 45. 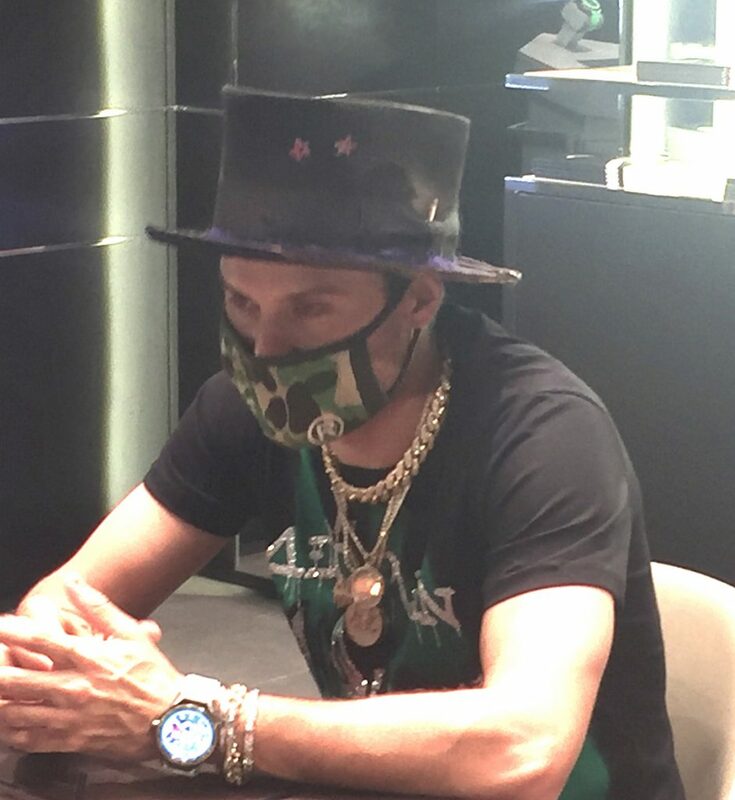 In a private interview with Alec Monopoly he confessed that he has always loved watches and was thrilled when TAG Heuer approached him. He enjoyed designing a dial that will appear on 300 Connected Modular 45 watches, and painting the straps in front of a throng of fans at the Miami Design District where TAG Heuer has a boutique. The new TAG Heuer Connected Modular 45 watch being sold with the additional unique white rubber strap painted by Alec Monopoly in Art Basel Miami, retails for $1,800. Monopoly’s paintings retail for anywhere from $20,000 and up. 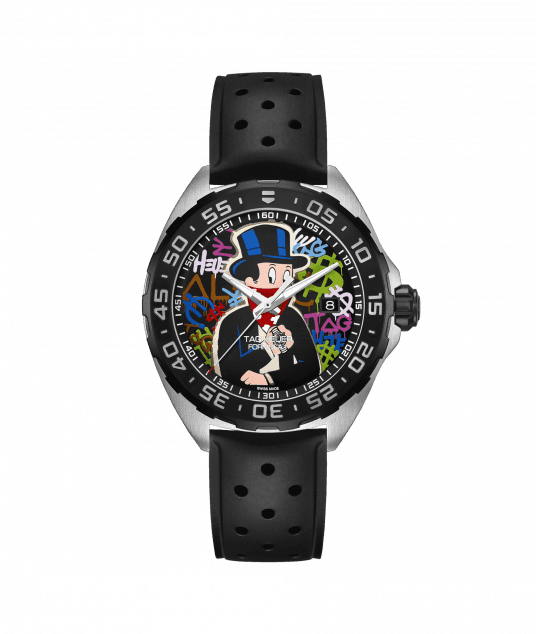 The TAG Heuer Alec Monopoly Formula 1 watch ($1250) was unveiled earlier this year. Good manners prevent me from commenting.